Russia has not initiated negotiations on a possible exchange of Ukrainian film director Oleh Sentsov for Russian citizens Viktor Bout and Konstantin Yaroshenko, who have been convicted in the United States, Ukrainian Foreign Minister Pavlo Klimkin said. "If at any moment they want [to start negotiations on Sentsov's release], I will certainly communicate with them. But they have not said it either to us or the Americans at this point," Klimkin told the ATR television channel on Monday. Klimkin also said that as far as he is concerned, any option leading to Sentsov's release will do. "As for any talks with the U.S. sidelining Ukraine, as it is formulated there, the U.S. won't do so. I discussed both the issue of political prisoners and the issue of hostages' release at my numerous meetings in New York. There is 100% certainty about that," he said. Such information is not accidental, Klimkin said. 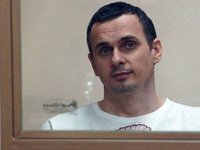 The Russian newspaper Novaya Gazeta reported, citing its source, that the main condition for Sentsov's return to Ukraine is the extradition to Russia of Viktor Bout and Konstantin Yaroshenko, as well as Maria Butina, who has been arrested in the U.S.
Russian presidential press secretary Dmitry Peskov on Monday denied having any knowledge of the alleged plans to exchange Sentsov, who has been convicted of terrorism in Russia, for Bout, Yaroshenko and Butina.